Canada is seeing the middle class shrink. After tax, Canada ranks a poor 19th in a measurement of income equality according to a recent study by the Organization for Economic Cooperation and Development (OECD). Even the TD Bank expresses concerns. See the CBC news item, and the OECD report. AS PROTESTS GO, it was a small one, but it saved lives—and now it’s inspiring art. With 14 original compositions performed live by CCEC member Bill Sample, directed by CCEC member Jay Hamburger and featuring ex Raymur resident protestor mom and CCEC member Carolyn Jerome. 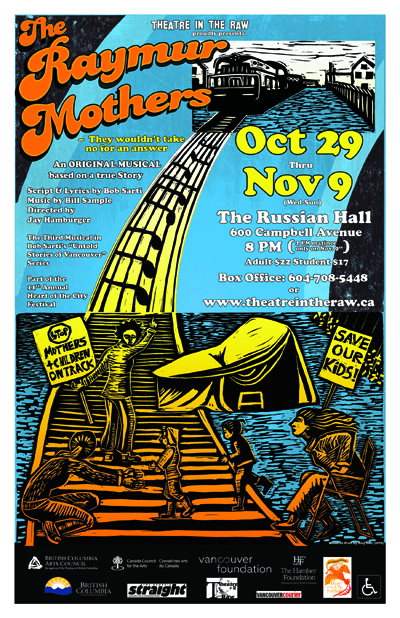 The Raymur Mothers—They Wouldn’t Take No for an Answer at the Russian Hall from Wednesday (October 29) to November 9. Actors Danielle St. Pierre and Karita Sedun flank the people whose story they’ll resurrect: (left to right) daughter Liisa Atva and mothers Barbara Burnet, Joan Morelli, Carolyn Jerome, and Muggs Sigurgeirson. It was an accident waiting to happen, but it wasn’t going to happen on Jerome’s watch. After repeated phone calls and a letter-writing campaign failed to prompt a response from city hall or the two railroad companies using the tracks, she’d had enough. Along with a small group of other mothers, she decided that the only way to make their point was to shut down rail access to the Port of Vancouver. 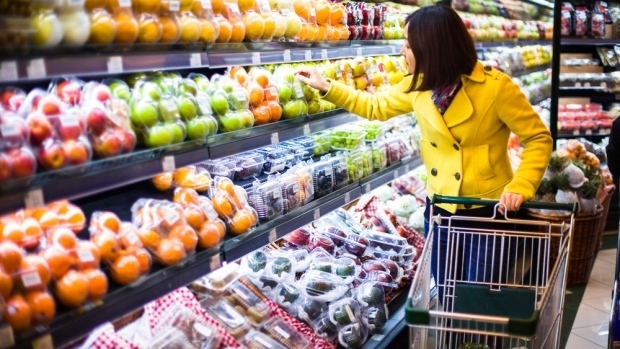 While working-class moms could be ignored, she reasoned, business is business. After three more blockades, the railroad companies won a court injunction to keep the mothers off the tracks, but they also adjusted their schedule to allow for safer school-day crossings, and in time a pedestrian overpass was built. Direct action had won the day. The story of the mothers’ struggle for safety has recently been revived in both online and musical-theatre form. To see historic footage of Jerome and company, visit blackstrathcona.com/#militant-mothers. And now Theatre in the Raw is launching The Raymur Mothers—They Wouldn’t Take No for an Answer as part of the Downtown Eastside’s annual Heart of the City festival. group’s “Untold Stories of Vancouver” series. Like those earlier pieces, The Raymur Mothers draws on the talents of director Jay Hamburger, composer Bill Sample, and playwright Bob Sarti, collaborators for more than a decade. Their chemistry is remarkable, although not always easy: in a separate telephone interview, Hamburger talks about having to shrink the show from its original three-hour running time—“Bob’s a stickler for detail,” he notes wryly—and describes how numbers like “Hell No” and “Direct Action” have been developed. Hamburger adds that in the interest of theatricality, a relationship-oriented subplot runs parallel to the story of the protest. Jerome isn’t entirely sure about that development, although she recognizes that The Raymur Mothers has to be entertaining as well as educational. “It’s really generous of them to take the time to put this into the history of Strathcona,” she notes, before adding that she’s especially happy that the show’s message is clear. The US 'Foreign Account Tax Compliance Act ("FATCA") is intruding into the lives of many Americans living outside the US and many people with US links. The organization Democrats Abroad has undertaken research and the report, recently published, details the problems being faced by people. In Canada, there is a constitutional challenge being mounted, principally based on the state's subversion of personal privacy when banking information is shared with the US tax authorities. The FATCA is a dramatic alteration to tax treatment such that tax is collectible based upon citizenship rather than residency, and it casts a wide net trying to catch 'tax cheats', but intruding into many peoples' lives. Canada has signed an 'Inter-Governmental Agreement' to apply FATCA in Canada, and the CRA Guidance to the administration of the agreement exempts many small financial institutions. 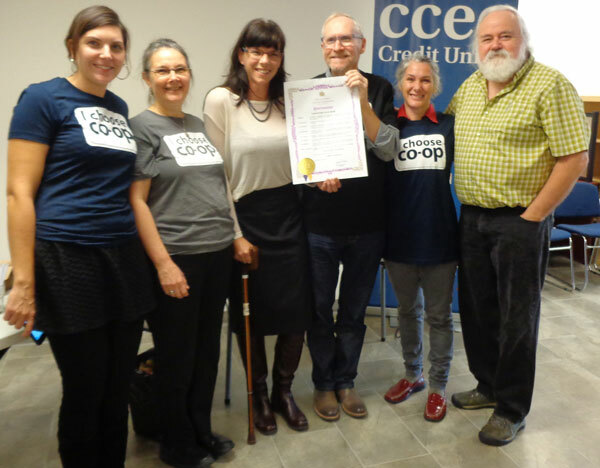 Thank you to Councilor (and CCEC Member) Andrea Reimer who presented the Credit Union Day Proclamation signed by the City to Ross Gentleman , CEO and General Manager, CCEC. In attendance at the event, which was part of our Annual Pancake Breakfast was BC Co-op Association Executive Director, Carol Murray and Sherese Johnson, Engagement Coordinator; and CCEC Board Members Tammy Lea Meyer and Marty Frost. Ingredients for our pancake breakfast purchased from East End Food Co-op featuring products produced by co-ops. 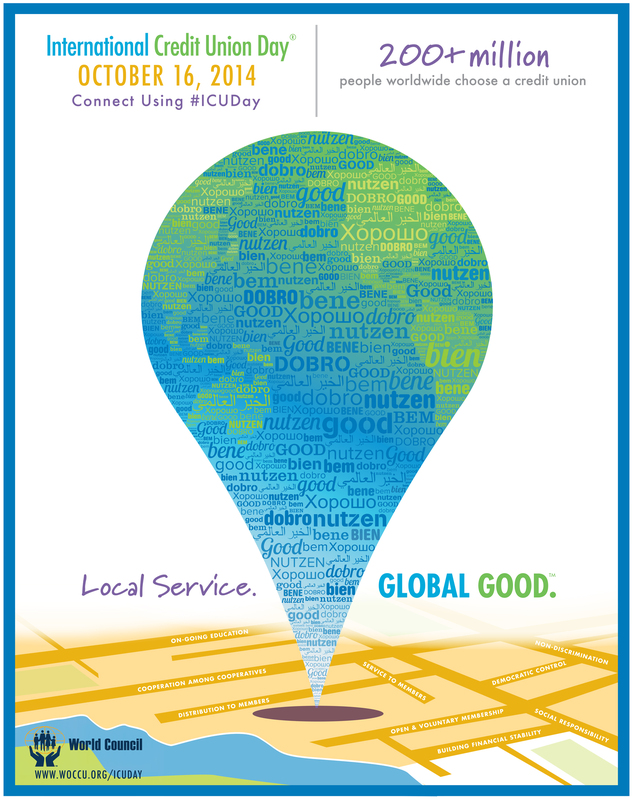 Join us as we celebrate Co-op Week, October 13-19. 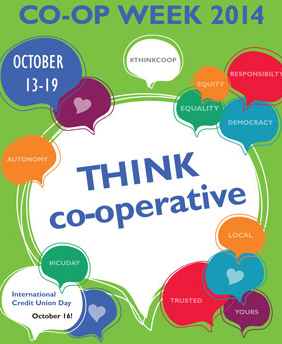 There are lots of activities planned to learn more about the co-operative movement and how co-ops contribute to our local economy and to the betterment of our community. Click here for more information on the BC Co-op Association Website. Join us at the branch as we host our annual pancake breakfast from 10am-12nn. Pancake flippers include your CCEC Board Members and BCCA staff. I Choose Co-op T-Shirts will be on sale. 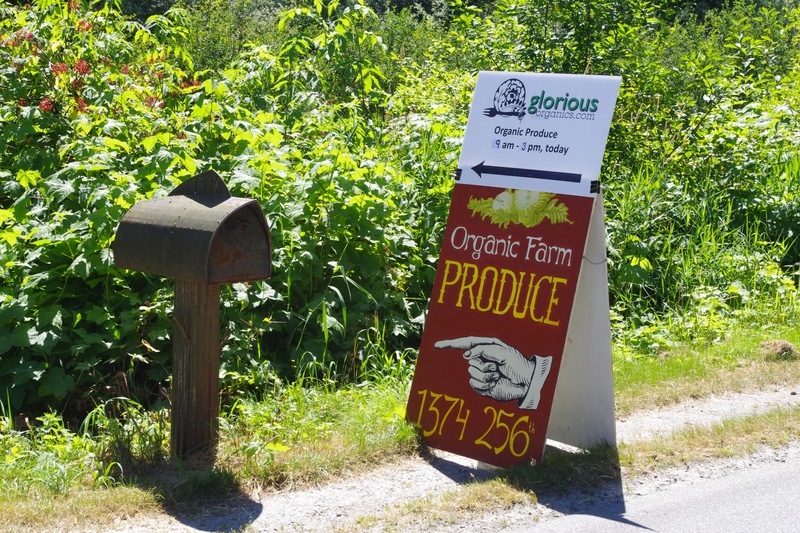 Location: Grandview Park, Commercial & Charles St.
As part of the BCCA’s Momentum Centre: The resource hub for new, emerging and established co-ops, this FREE workshop will explore co-operative solutions to social and environmental issues. Developing policies and a vision for progressive, sustainable jobs agenda for BC is the outcome for this one day conference. Currently, the BC government is putting virtually all its eggs in one basket— expansion of natural gas development, with a promise of economic windfalls and increased jobs for British Columbians. This comes at a time when more aggressive action on climate is needed. 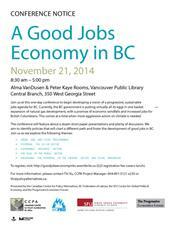 To register, visit: http://goodjobseconomyinbc.eventbrite.ca ($25 registration fee covers lunch). 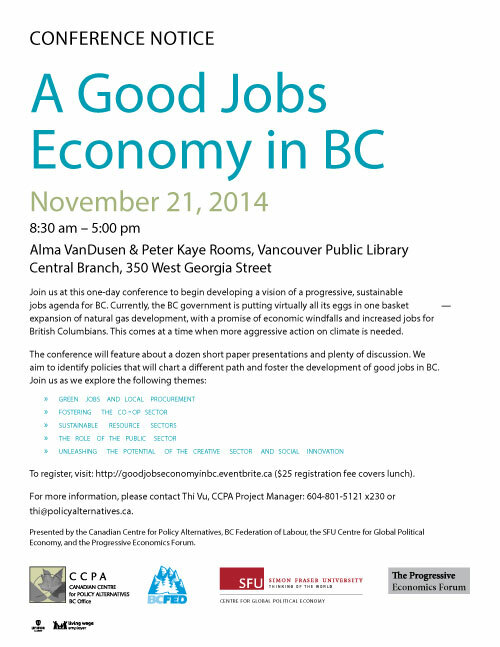 For more information, please contact Thi Vu, CCPA Project Manager: 604-801-5121 x230 or thi@policyalternatives.ca. Presented by the Canadian Centre for Policy Alternatives, BC Federation of Labour, the SFU Centre for Global Political Economy, and the Progressive Economics Forum.